PROUD HOME OF TIMBERWOLVES WRESTLING! Make sure you visit our “Stay In Touch” section to sign up for our Booster Club Emails! Coach Peterson would like wrestlers to sign up for the Summer Strength & Conditioning at CPHS. 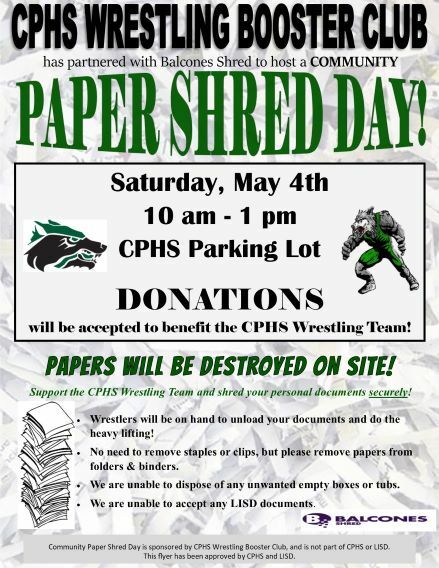 On Saturday, May 4, the CPHS Wrestling Team will partner with Balcones Shred to provide shredding services to the community! All documents will be destroyed ON SITE! Wrestlers will be there to do the heavy lifting, so that you don’t even have to get out of your car! There is no fee, but donations will be happily accepted to benefit the Timberwolves Wrestling Team! To introduce wrestling to boy & girl Middle School students (7th & 8th grade). The developmental program is FREE to any student that lives in the Cedar Park High School feeder pattern. All sizes & skill levels welcome! Practice will begin on Monday, April 8. 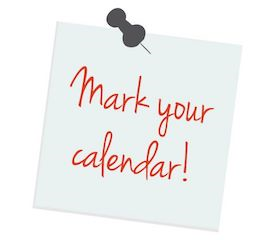 Practices will be held Monday / Tuesday / Thursday from 4:30 - 6:00 pm in the Cedar Park High School Mat Room (located to the left of the Field House). Congratulations to our State Winners! Every time you shop at Amazon you could be making a donation to the CPHS Wrestling Team! It is an easy change to make! Just click on the banner below! Please Note: we are listed as “Cedar Park High School Athletic Booster Club”.